A collection of curiosities studied by Danish natural historian Ole Worm. His observations were published in Museum wormianum (1655). SGC RBK W.257. 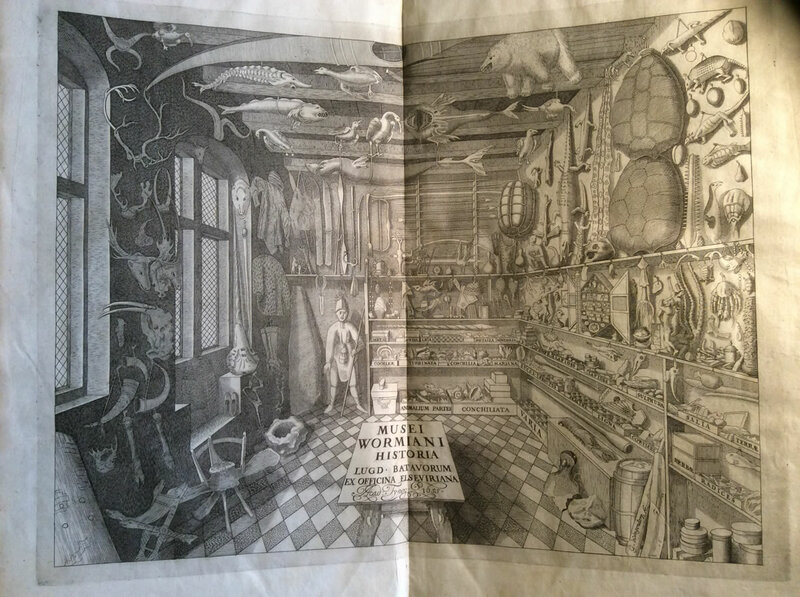 This splendid engraving of ‘Worm’s Museum’ comes from a volume in the St George’s Chapel Chapter Library named: Museum wormianum. Seu Historia rerum rariorum…, ‘Worm’s Museum. Or a history of rare things…’ (Leiden, 1655; SGC RBK W.257). The historic library of the Dean and Canons of Windsor contains a large number of texts about religion, as might be expected of a collection in an ecclesiastical setting, but a wide variety of other genres and areas of interest are also represented. History and Classics are very popular, as are geography, literature and studies of language. Meanwhile, science and medicine are certainly not overlooked: the library contains around two hundred books devoted to scientific subjects, demonstrating the breadth of the interests of the Dean and Canons as learned men as well as clerics. The Museum wormianum is a particularly fascinating example of the quest for knowledge about the world. The author, Ole Worm (usually Latinised in his publications as Olaus Wormius), was born in Denmark in 1588. He studied theology and then medicine and eventually became a lecturer at the University of Copenhagen in Latin, Greek, physics and medicine. He achieved significant status in medicine, becoming personal physician to King Christian IV of Denmark and earned great respect when he was one of the few physicians to remain in Copenhagen in order to care for the sick during an epidemic of the Black Death. In addition to his professional activities, Worm was a life-long student of the natural world. The engraving shown here is a depiction of his ‘cabinet of curiosities’, a room housing his personal collection of artefacts, fossils and taxidermied animals. In Worm’s lifetime many of these remained mysteries to the scientists of the day and he studied them extensively to answer fundamental questions about their origins. His careful engravings of the curiosities, along with his speculations about their nature and meaning, were collated and published posthumously in 1655 as the Museum wormianum. Amongst the discoveries, claims and theories put forward by Worm in this text are several that led the field in natural science in his day. For example, Worm proved that lemmings were rodents and not – as previously believed – spontaneously generated creatures that fell from the sky. The book also contains Worm’s evidence, the first to be gathered in accordance with modern, empirical methods, that unicorns did not exist. He demonstrated that objects believed to be unicorn horns in fact came from narwhals. He also conducted experiments to determine whether narwhal horns carried the anti-poison properties that had been attributed to unicorn horns by poisoning his pets and treating them with powdered narwhal horn.